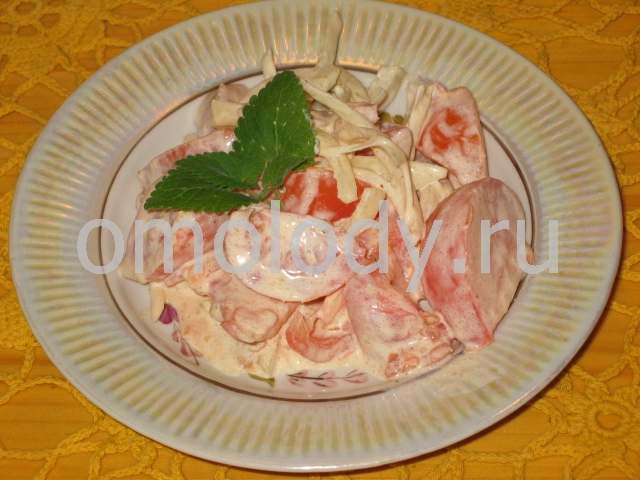 Salad Tomatoes with onion. Recipes from Russia. 1 cup onion, finely sliced. 4 - 5 medium size tomatoes, cut in wedges. 3 tbsp fresh parsley and celery. 1. Put in a bowl chopped in wedges tomatoes, add sliced onion. 2. Stir in sour cream. 3. Season to taste with salt and finely chopped fresh parsley and celery. Decorate with Melissa. Makes 3 servings.